What else is there to be said about the franchise? The production value of the films seems to go up, the darkness of the plot thickens, most of the former child actors seem to develop some form of adult physique and screen presence. 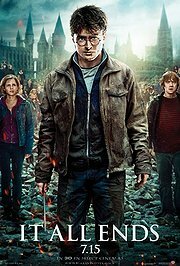 With the world of Harry Potter and the Deathly Hallows turning into a Gestapo nightmare, the lightness of the early parts is gone, and with it plenty of the humour that is a strength of the books. The films do not have time for these subtleties, and chase along to cover as many drama points of the book as possible in the slightly more than four hours available. Thinking back on those two films, I am not sure whether there were any scenes where I thought that it surpassed the imagery laid out in the book, maybe with the exception of the curse and spell lightning bolts thundering down on Hogwarts at the beginning of the final battle. Most of the film is the way it is and was through most of the series, an executive summary of a lengthy novel. And not the best book in the series, either, as displayed in particular by the role the title characters, the Hallows, play in the overall story, which is virtually none. The actual finale, with the stand-off between Voldemort and Potter, is even a bit underplayed, the supposed and as it turns out temporary death not really played to its full effect for those who had not read the books. This could have been a great cinema moment, with a solid hero sacrificing himself… but it was gone in an instant. Now it is over, and I have the feeling that the argument of the time of the first film – whether the simultaneously initiated Lord of the Rings trilogy or the Harry Potter epic would be the most lasting ones in cinema history – can be answered with: neither, really, it seems that history has already drowned the Lord movies in oblivion, and I cannot imagine that in 10 years from today people will have one of them good old Harry Potter movies for their Saturday night in the home cinema….